I thought it would be appropriate to use green in this Cactus Plant quilt block for the obvious reason. However, don't let that stop you from experimenting with any other colour choices that are your favourites. 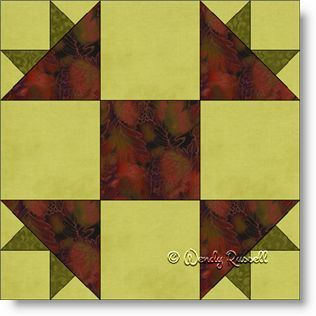 This quilt block is a little trickier than it looks on the surface, simply because it uses mirror image patches in the points of the "cactus". For that reason only, I have added it to the Intermediate level of difficulty. Other than that, this is quite a simple block to make and can provide a variety of looks in the finished quilt, as illustrated in the sample drawings. Both half square triangles and quarter square triangles, as well as flying geese units are used in this block.